Formed by myself Mr Adrian Thompson in February 2014. I have come from an office background working for companies such as Home Office, Ministry Of Defence, NHS and Bank of Scotland. 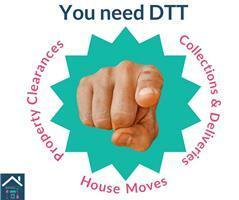 As the owner of DTT Removals & Clearance Services, we are in this business to take away the worries and stress you have. We cover a radius of approx 15 miles of Croydon, Surrey. DTT will always ensure a fair service.